본 연구는 단병접전 무기의 일종인 挾刀를 중심으로 통시적인 관점에서 무기의 변화가 전투현장 환경의 변화와 어떠한 관련을 맺고 있는지를 살펴보고자 하였다. 특히 협도의 경우는 군사들에게 동일한 움직임으로 자세를 교육시키기 위해 연결된 투로 혹은 ‘形’의 형태로 정리되었는데, 이를 통해 신체훈련의 근대성이 무예에 어떻게 투영되었는지까지 연구의 범주를 넓혔다. 이를 간단하게 정리해보면 다음과 같다. 먼저, 협도는 조선전기의 기병방어 무기인 長刀의 특성을 그대로 가지고 있는데, 이것은 임란이후에 기병 방어용으로 정착한 夾刀棍과 鉤槍의 특성과 연결된다. 그리고 협도는 그 무예적 특징을 크게 두 가지로 설명하였는데, 첫째 협도는 협도곤과 같이 ‘一刺’라는 창의 기본 기법인 찌르기가 중심을 이루고 있다는 것이다. 둘째, 18세기 이후 진화된 협도 투로의 의도적 정교함과 좌우대칭성이다. 특히 자루가 긴 손잡이를 이용할 경우 나타나는 독특한 특징인 ‘陰陽手’가 규칙적이면서도 대칭적으로 나타난다. 이러한 대칭적 특성은 투로의 구성시 신체활동의 균형을 맞추기 위한 근대적 신체인식의 표현으로 볼 수 있을 것이다. 좌우 대칭적 훈련성은 개인의 몸에 대한 균형적인 발달을 위한 근대적 신체관의 정립을 통해 나타난 현상으로 조선후기 정립된 挾刀의 투로와 훈련방식에서 그러한 신체문화의 근대성을 엿볼 수 있다는 것이다. 협도의 자세의 분석을 통해 소위 ‘근대적 몸’의 인식과 탄생을 말할 수 있을 것이다. 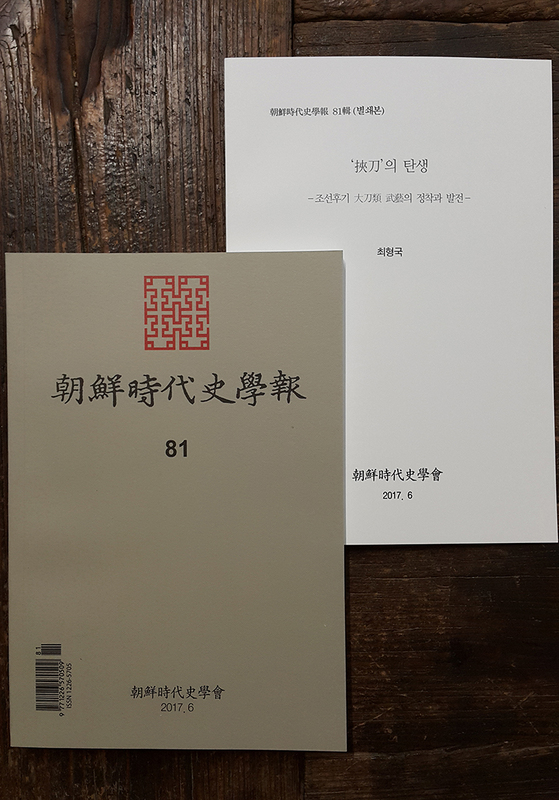 This research is about the relationship between the development of the arms and the development of environment in the combat field through the features of the ‘Hyeopdo(挾刀)’ which was a kind of short weapons for close distant fight. Hyeopdo was used in 'Turo(Connected attitude)' to train posture with same movement. The way which the modernity of the physical training had effect on to martial arts by the features of Hyeopdo was studied. And Hyeopdo had the features of the long sword which was a kind of defense weapon in the early days of Joseon dynasty. It was related with 'Hyeondogon(夾刀棍)' and 'Goochang(鉤槍)' for defense of the mounted troops after the Japanese Invasion of Korea in 1592. And there were the two martial art features of Hyeopdo. The first feature was stabbing which was basic skill of the spear like Hyeopdogon. The second feature of Hyeopdo was exquisite shape and bilateral symmetry. Specially, 'Eumyangsu(陰陽手)' which was the feature of the weapon with long handle was regular and symmetrical. This symmetrical feature might be the expression of the modern physical awareness for the balance of physical activity when the 'Turo' was composed. Bilateral symmetrical training which was the phenomenon appeared by setting up the modern view of body for balanced development of body was the modernity of physical culture which was found in 'Turo' of Hyeopdo and training methods. The awareness and birth of ‘modern body’ could be explained by analysis of Hyeopdo posture. Hyeopdo(挾刀), Hyeondogon(夾刀棍), Jangdo(長刀), Guchang(鉤槍), Long-sword martilarts, Somatic Culture, Modern Body, Eumyangsu(陰陽手), Martialarts History.